FOI enforcement – if not now, when? Recent ICO decision notices show the Home Office and MoJ repeatedly simply failing to respond to FOI requests. Surely the time has come for ICO action? This was despite the fact that they’d published decision notices about delays by those two government bodies which reported that “The delay in responding to this request will be logged as part of ongoing monitoring of the MoJ’s compliance with the FOIA”. This was not formal monitoring, I was told; rather, it was informal monitoring. Ah. Gotcha. Evidence of a possible problem in the media, other external sources or internal business intelligence. Despite the apparent increase in robustness of approach, the ICO do not appear to be monitoring any public authorities at the moment. The last monitoring took place between May and July 2016 when Trafford Council were in their sights. Although they are not mentioned in the relevant report, an ICO news item from July last year says that the Metropolitan Police, who have been monitored off and on for a period of years without any real outward signs of improvement, were also still being monitored. 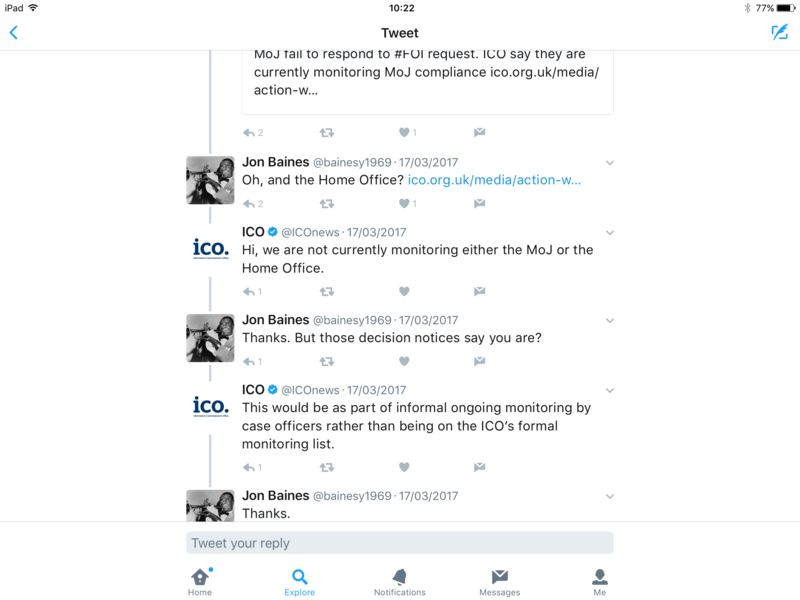 But if they aren’t monitoring the compliance of any authorities at the moment, but particularly the Home Office and the MoJ, one is led to wonder why, when one notes the pattern in recent ICO decision notices involving those two authorities. Because, in 16 out of the last 25 decision notices involving the Home Office, and 6 out of the last 25 involving the MoJ, the ICO has formally issued decision notices finding that the authorities had failed to comply with the FOI request in question, by the time the decision notice was issued. At this point, it might be helpful to explain the kind of chronology and process that would lead up to the issuing of such decision notices. First, a request must be made, and there will have been a failure by the authority to reply within twenty working days. Then, the requester will normally (before the ICO will consider the case) have had to ask for an internal review by the authority of its handling of the request. Then, the requester will have complained to the ICO. Then, the ICO will have normally made informal enquiries of the authority, effectively “geeing” them up to provide a response. Then, as still no response will have been sent, the ICO will have moved to issuing a formal decision notice. At any point in this process the authority could (and should) still respond to the original request, but no – in all of these cases (again – 16 of the last 25 Home Office decisions, 6 of the last 25 MoJ ones) the authorities have still not responded many months after the original request. Not only does this show apparent contempt for the law, but also for the regulator. So why does the ICO not do more? I know many FOI officers (and their public authority employers) who work their socks off to make sure they respond to requests in a timely manner. In the absence of formal monitoring of (let alone enforcement action against) those authorities who seem to ignore their legal duties much of the time, those FOI officers would be forgiven for asking why they bother: it is to their credit that bother they still do.